I love fall. I don’t know if it’s because my birthday lands on the autumn equinox, appointing me the autumn ambassador, but I simply love fall. Come October, Sonoma County is graced with wispy, low, early morning fog, headless horseman weather. Through the feathered haze, one can see orange globes, the jewels of the pumpkin patches, dotted across the earth, waiting to be plucked and carved. Clear, blue skies adorn the afternoons, crisply kissing my cheeks. I am reminded winter is around the corner, for the temperature sinks, inspiring me to cuddle up, seeking warmth. The trees shimmer in amber, gold and crimson. They shutter, and it snows dried leaves, littering lawns and streets. Fireplaces are filled; wood is lit, infusing night air with a forest spice. I inhale the nostalgia. The promise of the nearing holidays sooth my soul on a primitive level. I am still that child that loves to dress up for Hallows Eve. I want to be thrilled, chilled and tempted by mystery and sweet treats. Halloween crept up and rested on a Saturday this year. I spent the day puttering around the house, allowing my domestic whims and the day’s hours to sweep me into early evening. There is something so pure about a woman who toils in the home, polishing and primping her sanctuary, her nest. She is considered plain to the metropolitan eye. No make-up, hair pulled back, barefoot, wearing jeans and a thin t-shirt, she is dressed perfectly for the occasion. If she finds her work fulfilling, as I do, she glows. She is beautiful in her simplicity, hiding nothing, fanning her true colors like a rainbow across the sky. Her spirit is expansive, and her home fills with her heart. Anyone who walks in will feel it, smell it and be nurtured by it. This was me on Hallows Eve before my witching hour. This is me on any given homey afternoon. But, Saturday, October 31, was no ordinary afternoon. Knowing I would go out to see what haunts the holiday had in store, I began my meticulous transformation. I love dressing up, impersonating a fantasy. This year I pieced my costume together partly from my own closet and partly from my Halloween costume collection. I was unsure the outcome; but, I was sure if I followed my soul’s desires, I would create a look that I would find enchanting. I was inspired by a black Parisian gown, my new bindi and a recent interest to decorate myself in henna. 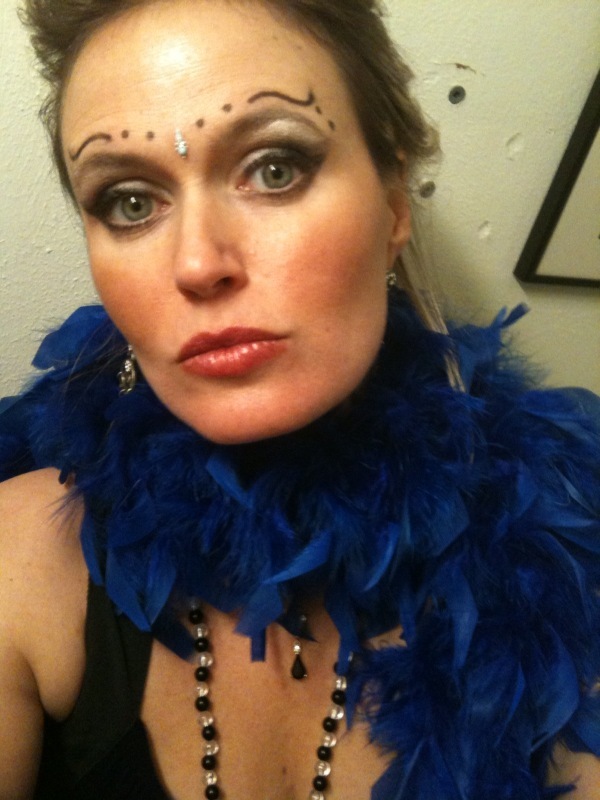 The result- I evolved into a French fortune teller named Madame Crystal. The evening was visited by many characters. Tricksters and players wandered the darkness, giggling, admiring and delighting. I, myself, sunk deep into the night. The hours clicked by without notice. Before I realized, 3am snuck up and nipped at my ankles. It was time to wash off the evening energies, the thick, black eyeliner and crawl snuggly between my sheets. This little pumpkin head needed to rest. 7am rolled by and parked its carriage next to my bed, waiting to carry me away from slumber. I awoke, thinking how grateful I am that I am RAW. I imagined most of the witches and goblins of Hallows Eve arose to sugar or alcohol induced headaches and sleep filled eyes, but not I. I popped up and met All Saints Day as it greeted me in return with that early morning, low lingering fog I adore. The morning was quiet, for many of the city’s inhabitants were sleeping off the witchy spells of the preceding night. I rolled out of bed and up to my laptop, checking my email first thing. I received a message from We Like it Raw. In it was a link to a Youtube video of Tim Van Orden and Courtney Pool. 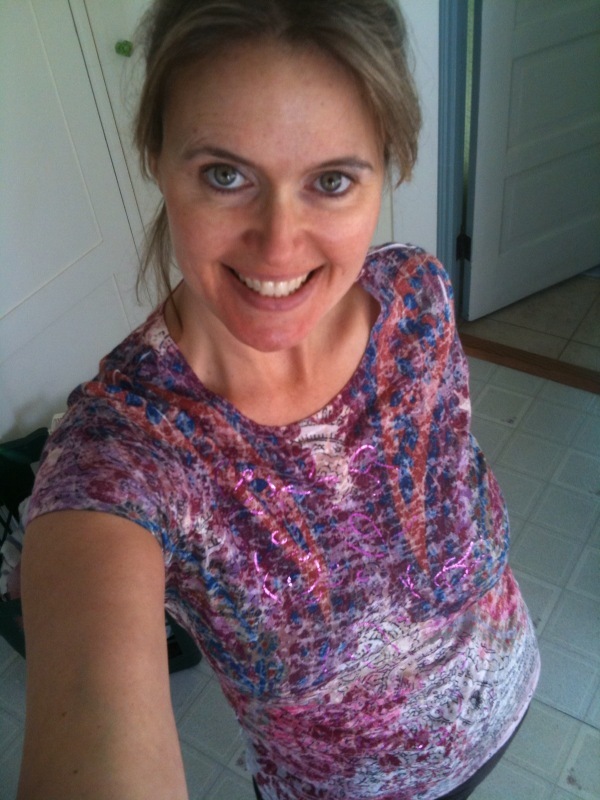 I watched the 3 minute video titled Spirulina Salad with Courtney Pool. I was immediately motivated to spend my morning gobbling up greens, staining my teeth in an emerald brilliance. How ghoulish, I thought as I chuckled to myself, knowing that I would be one of the few in town who would awake on the morning after Halloween craving sprouts and algae. The early hours ticked on. I never did get to that salad; though, it is on my list of recipes to make this week. Instead, I filled my morning with errands that kept me out of the kitchen. By 10am, hunger tugged at my stomach. My green salad craving needed attention, calling me into action. Remembering that Café Gratitude opens at 10am on Sundays, I pointed my car towards Healdsburg. There is something so wonderful about having delicious raw foods made for me. Often, I am the one creating such dishes. When I have the opportunity to relish in such wholesome culinary offerings, I do so with pure graciousness and love. I ordered an entrée called, “I am Fulfilled,” a large salad chock full of greens, sprouts, tomato, cucumber, carrots, beets and avocado, tossed in a creamy, raw, vegan caesar dressing and garnished with a flax cracker. I felt so at peace while I dined. I gave thanks for my life and the treasures within it. I blessed the season. I blessed the day, World Vegan Day. I blessed my food, and I blessed myself as I slowly ate. I giggled to myself as I enjoyed my abundant salad, thinking it was an odd breakfast choice for the average person. It was a breakfast of champions, a breakfast of raw girls like me. And, what do raw girls like me do after nibbling up a robust salad? Well, they order dessert, of course! Featured here is Café Gratitude’s raw cacao hazelnut pie. It was divine. I can happily report, I have embraced autumn and the first festive holiday of the season without a single piece of commercial candy. Fresh raw desserts are my treat of choice. I sat in the restaurant, delighting in the raw chocolate goodness, grateful for its availability. Pure bliss was gobbed on the end of my fork; and as I slipped each bite of the rich chocolate between my lips, I could think of little more than how wonderful is life. I love fall and everything it represents. Cherish your life. Everything is a gift. Treasure it all. Honor your inner child. Play. Love. Celebrate. Raw Chef Panel Q1: What do you eat? Q. Describe a typical day. What time do you eat? What do you eat? A. I like to meditate first thing in the morning, but I don’t want anything in my stomach to weigh me down, interfering with my energy flow as I tap into a higher state of consciousness. With this being said, my first meal is usually light. I would also like to add that every day is different and my palate changes with the seasons. In the warmer months, I will have a green juice or a green smoothie. I make the green juice with kale, cucumber, celery, ginger, lemon and, sometimes, garlic. All these vegetables, I run through my Green Star juicer. I love this juicer, for it provides a high yield of juice that is slow to oxidize. When I choose to make smoothies, I keep it simple. In the summer, when peaches are sweet and ripe, I adore peach smoothies blended with kale or spinach. Another all time favorite smoothie is mango and parsley. (For recipes, click HERE.) I am absolutely in love with mangos; and, after adding this particular smoothie to my diet, I actually salivate when I see parsley now. It’s a funny thing, but my body just craves these greens. I have noticed that the more greens I eat, the more I desire. I feel optimal physically, emotionally and spiritually the greener my diet. When I get hungry next depends largely on how I ate the day before. If I had heavy foods or ate a lot of calories the day prior, I may not get hungry until 1pm or so. If this is the case, I will have a late lunch. However, there are other days I feel hungry much sooner. I have no qualms about eating my lunch as early as 10am. I don’t get hung up on timing. I think too many people ignore the body’s need for energy, being slaves to a specific snack or lunch hour. The body knows when it needs fuel. Just listen to it. Lunch, for me, is a huge salad. I like to vary my green leafy vegetable intake for culinary variety and for health. It is important to me that I get a wide spectrum of nutrients from foods. In addition, my salads always include one whole avocado. I find by combining an avocado with a large amount of fibrous foods, I am completely satiated. One of my staple summer salads is made with avocado and strawberries. I will make this with an entire head of lettuce, adding one cubed avocado and a large basket of strawberries, sliced. I toss these ingredients in a light oil, lemon, basil dressing. This is easy, fresh and very fulfilling. If I need to snack between meals, I usually do so with fruit. One of my favorite fruits are figs, and when they are in season, and full of sweet goodness, I can easily eat a pound or so. My eyes actually roll to the back of my head when I bite into a plump, succulent fig. Yummy! Please make note that I use the disclaimer, “when the fruit is in season.” I try to only eat seasonally. In doing so, I am supporting and consuming eco-friendly, locally grown and highly nutritious produce. Another fun snack I have recently added to my diet is chocolate in the form of raw cacao. I have a low tolerance for stimulants, and cacao is certainly one. I can only take it in small doses, but I have discovered that a little will not only satisfy me for hours, but it actually elevates my mood. I like to make a chocolate ganache with a heaping teaspoon of cacao powder, softened coconut oil, and a splash of agave nectar or a mashed banana for sweetness. This is the basic recipe. To this, I will sometimes add coconut flakes and superfoods like maca, spirulina, blue green algae and/or Vitamineral Green. This creates a chocolate superfood jolt of pure bliss and happiness. However, due to my sensitivity to the stimulating effect of cacao, I will only have this early in the day. And, I will never have this treat before any spiritual work like meditation or Reiki healing. This is not a grounding or a spiritually stabilizing food for me, so I use it mindfully. If my physical activity was low or I drank over a quart of green juice earlier in the day, this could be enough food for me. However, there are many days this is not the case. My second meal varies considerably. I do have an active social life, and there are many times I will visit the local raw food restaurants for a meal. I prefer lighter fare, entrees that use few nuts. I also enjoy raw desserts, so I will often order one when out. They are so divine and hard to resist. Though, I do occasionally order nut based desserts, I usually pay the price for that decision. Nuts make me feel acidic and dehydrated. I often wake the next day, feeling puffy with watery eyes and a runny nose. But, as uncomfortable as that is, sometimes it is hard to pass up well made sweets. I know the consequences when I order or make dessert; I accept the results, and I choose, consciously, to savor it. If I ate nut-dense meals or desserts daily, a raw diet would not be healthy or sustainable for me. Being a conscious eater is key. I am aware of my choices. I know my body, and I thrive when in balance. With this being said, more often than not, I make my own foods. Dinner at home could be anything from a shredded cabbage, cilantro, lime salad to a carrot, beet, garlic salad or a simple romaine lettuce, avocado salad tossed in capers. The more green vegetables I eat, the better I feel on every level. I treat myself to complex meals from time to time, but for the most part, I am a simple raw foodie. Every day is different. My diet ebbs and flows with my energy output, my spiritual work, my mood, the weather, the seasonal produce available and my social life. As I write, today is a dark day. Autumn has firmly set in, bringing with it billowing charcoal-grey clouds. I am craving warmth. I also had a heavy seed day yesterday, for I ate a fair bit of raw granola from Two Moms in the Raw. Because of this, today I am simply not that hungry. I am listening to my body. Though this doesn’t sound like very much food, it may well be all I need for the day. I find when I eat calorie dense foods one day, my body naturally balances itself the next. If I do, indeed, feel the need to eat later, I will most likely have a light green salad with very little fat, meaning no avocado, nuts or seeds. My best advice is to be highly conscious of what you are eating and why. Listen to your body. Pay little homage to delegated meal times and peer pressure. Eat what feels right for your activity level and mental/spiritual clarity. Eat well, allowing your body to stay in balance. Listen within. Eat for health and enjoy the pleasure of it. Cherish your food and honor yourself.